Tanus was old when she first met Amber, and the question of her age is a great question. To those in Amber and other foreign lands, Tanus is the great city at the mouth of the greatest river in shadow. It is the head of a great trade network of barges and rivermen, and the city is an unending bazaar of the strange and wonderful amidst buildings a thousand years old that have been converted to whatever use they are needed for this day. To the Tane, the heart of their land is Dvaraka, the sacred city at the first great merging of the riverways. 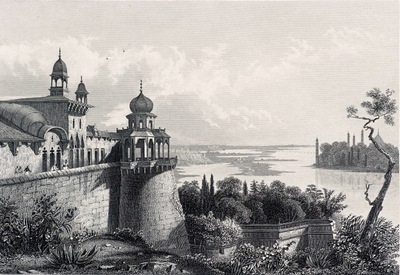 While Tanus is sacred and blessed as the place the River goes to sea (and for it's commericial value), Dvaraka is the capital recognized by the Maharaja, the river kings of Tanus. Play in Tanus is slightly different than in the rest of the game. Gifts and such all work as they are described, but resolution is expected to use the storybuilding system rather than the normal conflict system. This means the stakes of conflicts will generally be higher, and players uncomfortable with that potential price may wish to opt out of Tanus play. By extension, Tanus players are expected to respect the boundaries of players outside of Tanus, and not bring other issues into the Tanus arena in an attempt to force the use of storybuilding. As a rule of thumb, if you need to force or trick someone into using storybuilding, you're operating in the wrong spirit. The sun rises in the east in Tanus, and sets in the west, and the river's three great cities are the rise, apex and setting of that sun. To the east, at the mouth of the great river, is the city of Tanus, from which the realm gets its name. The city is ancient, perhaps even older than Amber. Tanus is currently somewhat restricted as a place of origin and play - detail will be available shortly.